Study root causes of burnout and promote wellness and career longevity for AAEM members. Examine the current state of EM physician wellness and burnout. Publish and disseminate this information. Continue to monitor EM physician wellness and burnout and provide regular updates to the Academy. Explore and examine possible causes degrading wellness and causing burnout. Create best practice models for physician practices that best promote wellness, resilience and minimize burnout. Create a physician self assessment tool so Academy members may assess their current state of wellness and risk of burnout. Create educational content on wellness, resilience, and burnout. This content should contain self­ directed activities, on­line resources, and live presentations and discussions for AAEM Scientific Assembly. Recognize physician leaders who have resilient careers and inspirational emergency practices. Create a mentoring program between physicians coping with burnout and resilient physicians leaders. 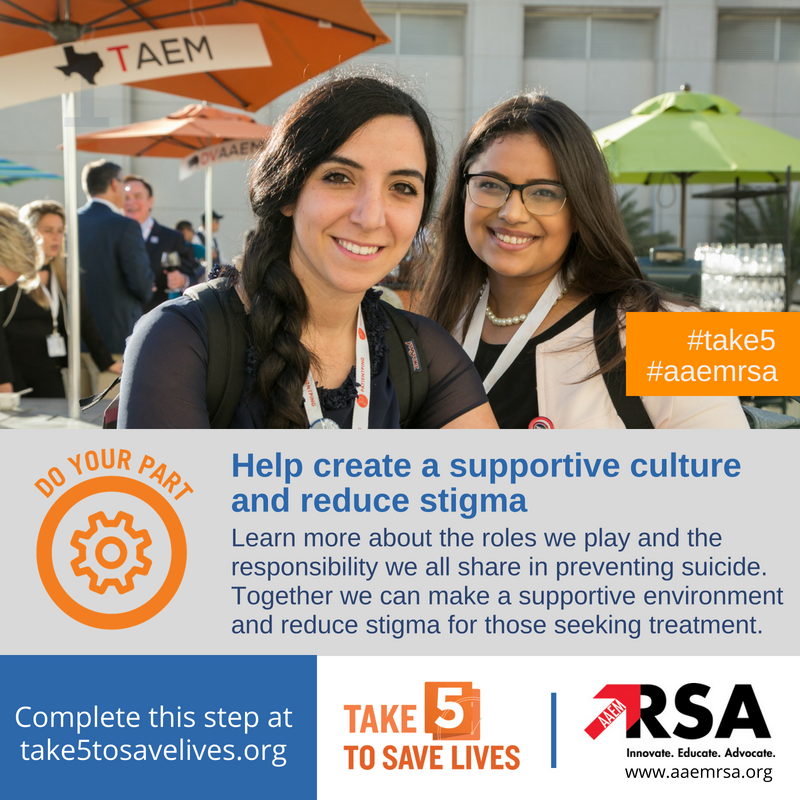 Create wellness and resilience activities for members at AAEM Scientific Assemblies. Explore the correlation between wellness and burnout in different types of practice environments. Below are some links to online anonymous self-tests. To provide an opportunity for organizations across the country to discuss and share plans of action to reverse clinician burnout and promote clinician well-being, the National Academy of Medicine (NAM) has collected statements describing organizational goals or commitments to action. By sharing their commitment to improving clinician well-being and reducing clinician burnout, these organizations are an active contributor to the NAM’s Action Collaborative on Clinician Well-Being and Resilience. AAEM believes that state licensing boards and credentialing organizations should require physicians to disclose mental disorders only when the disorder currently impairs their judgment or ability to practice. AAEM believes that state licensing boards and credentialing organizations should refrain from asking about past history of mental disorders as such inquiries discourage professionals from getting treatment that could prevent impairment. Emergency Medicine Still Revs Our Engines, So Why Do We Feel Like We're Running on Empty? Late Career Resiliency: Is It Time to Make a Change? The Wellness Committee strives to make AAEM's Annual Scientific Assembly a motivational retreat where you leave feeling a renewed passion for emergency medicine. 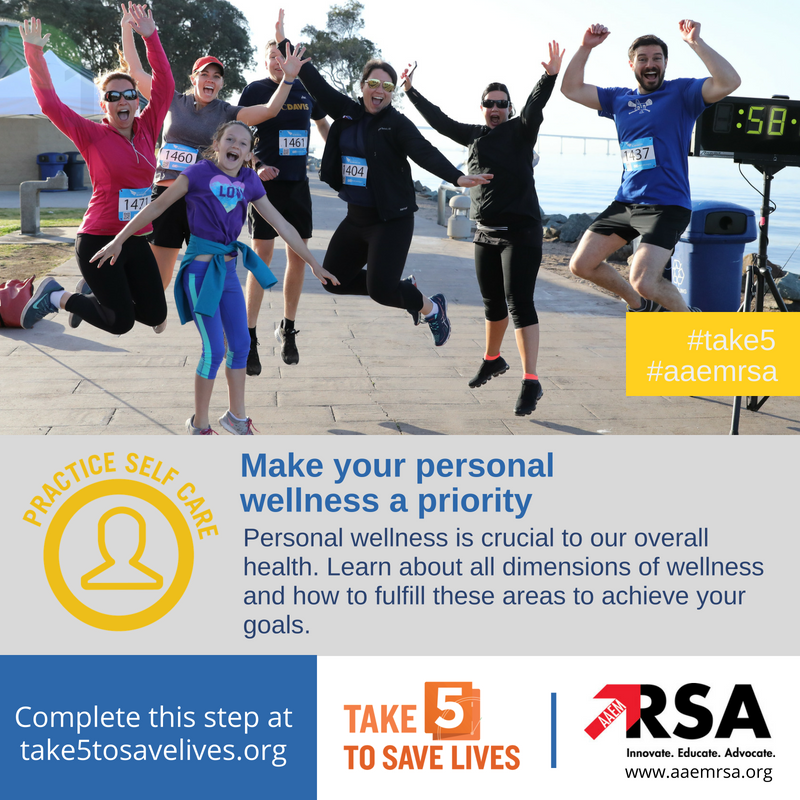 We coordinate morning wellness activities to set your focus for the day, Airways at AAEM - a story telling event, a wellness room that attendees can go to for a break, and more. 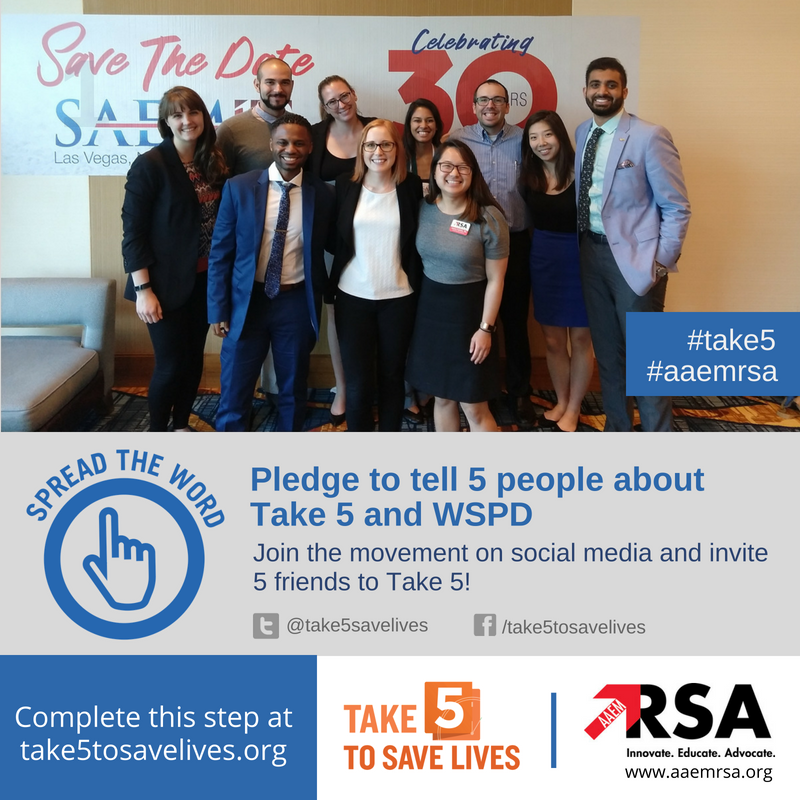 In order to address the issue of physician suicide, the Council of Emergency Medicine Residency Directors (CORD), in collaboration with AAEM, ACEP, ACOEP, EMRA, RSA, RSO and SAEM have come together to annually dedicate the 3rd Monday in September as National Physician Suicide Awareness (NPSA) Day. Learn more. 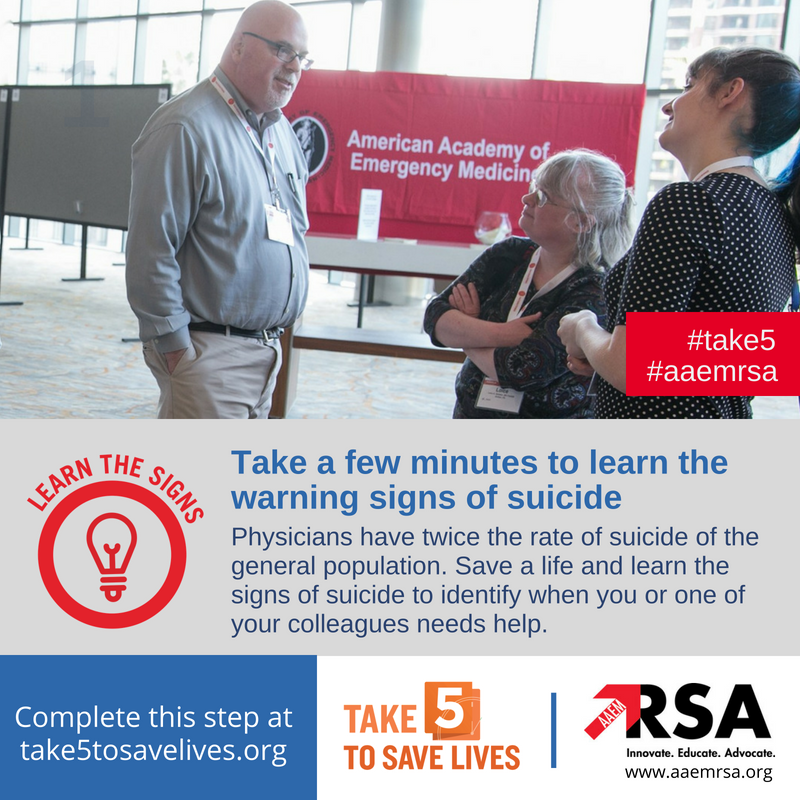 Download the emergency medicine #take5 graphics kit to share and spread the word! Share your story using #DocsTalkSuicide on Twitter. Join the conversation and see you're not alone. A spotlight on physician suicide based on a personal struggle. Presented by Loice Swisher, MD FAAEM at AAEM17. 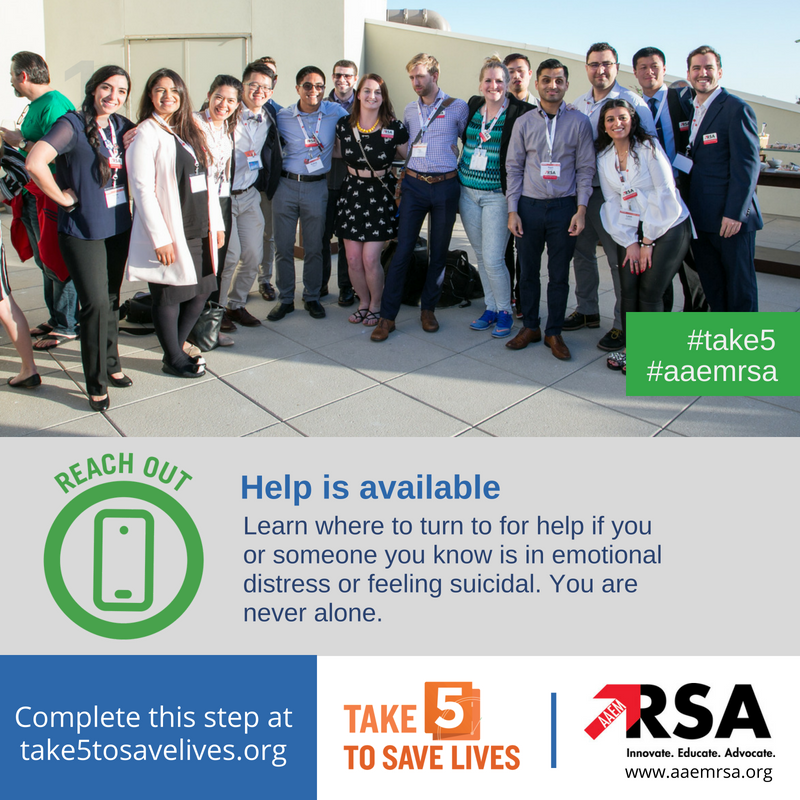 Residents and Students: Learn more about how you can get involved in the AAEM Resident and Student Association (RSA) Wellness Committee.